To install the Data Everywhere Excel Add-In, please head over to the add-in download page where you will be given quick start instructions. The following will outline as many as possible of the dialogs and prompts you will see when installing Data Everywhere. To start, browse to the download page in another tab where you will see the following. Click "Run" in the download footer. If you are using a browser besides Internet Explorer, no problem at all, simply follow the directions your browser gives you to run the file. 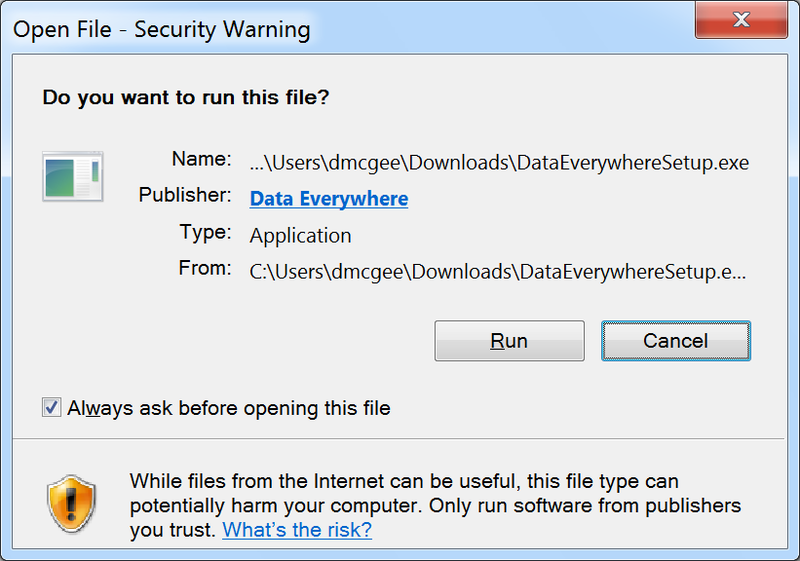 If prompted, click "Run" in the "Open File - Security Warning" dialog box. You can confirm this file is legitimate by clicking on the "Data Everywhere" publisher hyperlink. 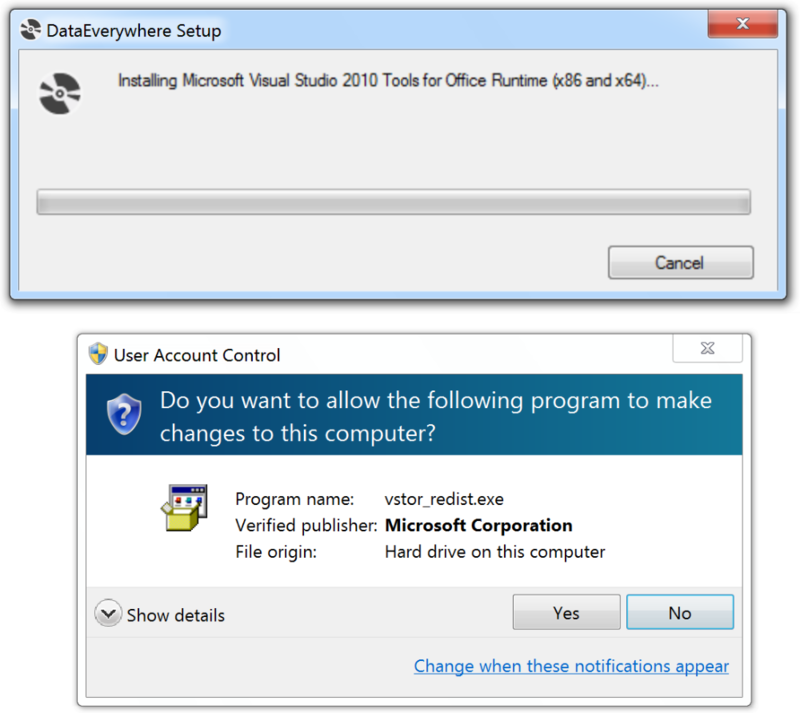 You may receive a dialog box or dialog boxes like the above to install additional components needed for the Data Everywhere Excel Add-In to run. These are provided by Microsoft. You must "Accept" to continue. 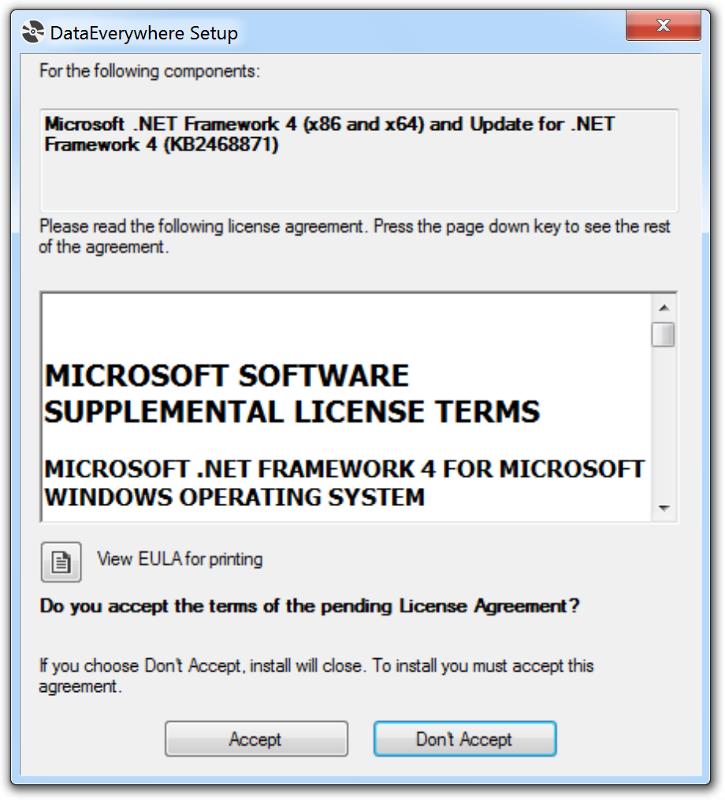 If you do not see a dialog like this, there is nothing to be concerned about. Your machine already has the components installed so nothing further is required. If you are prompted to allow "vstor_redist.exe" to make changes to your computer, click "Yes". This is a component provided by Microsoft required by the Data Everywhere Excel Add-In. Installation of required components will continue. Once again, you can confirm the installation is legitimate by clicking on the "Data Everywhere" publisher hyperlink. Click "Install" to continue. Download and install will proceed quickly. If you see this dialog box, installation of the Add-In was successful. Please launch Microsoft Excel where you will see a new "Data Everywhere" ribbon item. If you encountered an error dialog during the installation, please see the related articles or search the text of the dialog to find more details on this support site. 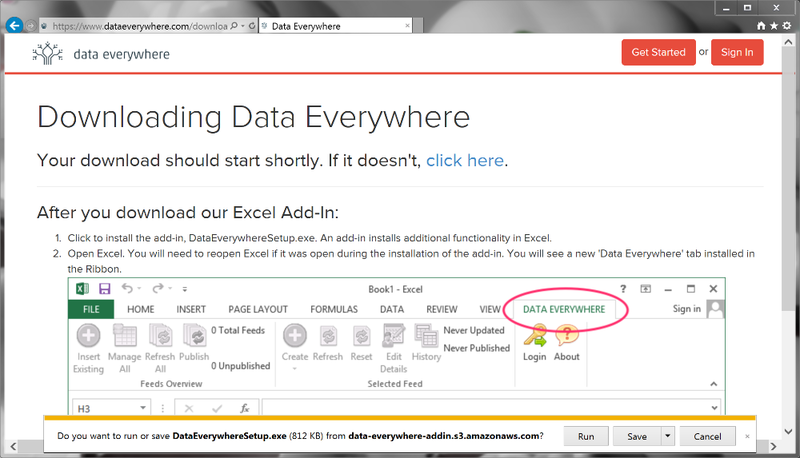 If after launching Excel you do not see Data Everywhere in the ribbon, or have any other problems, please contact support via support@dataeverywhere.com.